Time to get real about YOUR marketing! Let's face it I've been blogging for a while now. Blogs are available on almost every subject and if one doesn't hold your interest you simply move on to the next. I'm one of a multitude of travel related bloggers out there and if you combined all our efforts we've worked extensively on the subject of travel. Blogs are immensely popular, yet even if we've specifically mentioned your hotel, restaurant or attraction you've probably only benefited minimally from our efforts no matter how massive the amount of information we've put out. That being said getting mentioned in a blog post is still important, but we need to address the whole travel marketing picture. If anything, most blogs serve the user (guest) and really great destinations don't get equal billing nearly enough. I'm here to change that to mutually benefit both you and potential guests. To avoid being overly wordy we're putting hotels/lodging, restaurants and attractions (theme parks, museums, etc.) together under one term-destinations. After all, you are a destination and from a marketing perspective if you're not thinking of your place as such you should be! The easiest marketing campaign challenge to address is #3. To get guests to come back you must provide them with an acceptable value for their money and their time; you must perform to a reasonable expectation. Do that and they will return. Don't do it and they won't. Perform above expectations and they'll SHARE. Perform below or mislead them and they will likely SHARE negatively, sometimes very negatively. Misleading guest is a huge mistake! Surprisingly this practice is still fairly common and it hurts everyone in the travel industry. Consequently there is now a website that exposes places that mislead guests. Performing above and beyond guests expectations, fulfilling their desires can get you a viral response and that's pure GOLD! Let's face it, positive word of mouth from your guests is the absolute best marketing and you can't buy it you have to earn it. If you are already doing this, that's fantastic! You are the destination guests are searching for. The good news is you don't have to be outrageously expensive or exotic to be that destination. Yesterday I happily tweeted, and it wasn't the first time, about an attraction just outside of Yosemite we visited a few years ago because it's such a great memory! 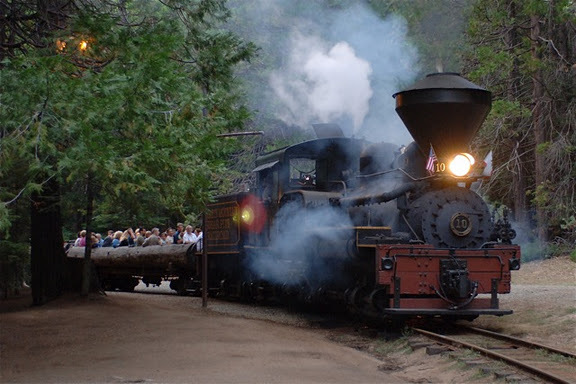 I haven't been back to that area (six hour plane trip) but I happily tell others about Yosemite Mountain Sugar Pine Railroad - GREAT family fun! So if you didn't know about it already or stumble upon it by chance on the internet, like here, how likely are you to find them? How do potential guests find you? For this, #1on the marketing campaign list, there is help. Of course, traditional methods of marketing (television, radio, print and direct mail) are still available but, only minimally effective. I could spend considerable time on this subject, but for now let me just say this, These methods are akin to playing roulette; plunking your money down, picking a slot then spinning a wheel and rolling a ball hoping luck lands it in your slot. They're too unpredictable at too high a cost. Ask yourself this, When you do get lucky and get your ad in front of your potential guest are they really paying attention? Fast forward to the Internet - the worldwide web. Your potential guests are using it. They are out there. Great! Right? Considering how vast the Internet is we might as well be saying, aliens do exist - they are out there - somewhere. What you want to know is, How do I communicate with them? How do our potential guests find us? The internet is suddenly your best friend and your worst enemy. I've heard it all - lack of time, fear, frustration. It's frankly overwhelming! Help is here and I'll take you through the steps over the course of this series of posts. Hey @travelvisions I'm on #twitter now-follow me. If you're already tweeting - awesome! Send me the same tweet from above and I'll follow you if I'm not already doing so. If you are ahead of the curve and already tweeting please don't think this series of posts isn't for you. I promise you we will improve your marketing methods in the coming weeks if you stick with me. Coming up next post I'll delve further into the simple social marketing things you MUST do! Until then, I look forward to your tweet! Any rules to Tweeting besides the 140 characters? What if I don't have something to tweet everyday? Thanks for your comment. 1.) No rules per say. I recommend you keep it within the realm of your business expertise and keep it positive. 2.) There is always something to say even if it's just, have a great day. Try to tweet something informative or interesting most of the time. It could be about your industry or another business in your area. Don't forget to retweet.